Sackhumvit Trust organized a field visit to Lalbagh for Dream School Foundation’s (DSF) HeadStart students at R.T. Nagar’s education and development centre. 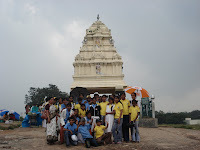 The objective of the field trip was for students to learn about the variety of flowers, trees, and agricultural produce available in Karnataka, to explore the sites of Lalbagh while learning about the history of the botanical gardens, and to partake in celebrations of India’s Republic Day (January 26th 2010). 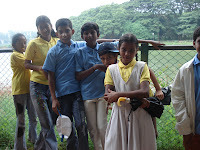 A significant component of the field trip involved students learning about the history and landmarks of Lalbagh, which spans a total of 240 acres in southern Bangalore. The garden was commissioned in the 18th century by the prevailing ruler of Mysore, Hyder Ali, and was later completed by his son, Tipu Sultan. Hyder Ali designed the garden according to landscapes of the Mughal Gardens. Tipu Sultan further developed the garden by importing trees and plants from several countries like Persia, Afghanistan and France. Over the years, Lalbagh has acquired new features such as India's first lawn-clock, and the subcontinent's largest collection of rare plants. Today the garden has trees that are over 100 years old. 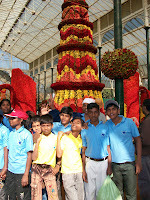 All the students were excited to attend Lalbagh’s flower show at the Glass House; a bi-annual event that celebrates India’s Independence and Republic Days. Ayyanar, a 9th standard student from a Tamil-Medium government high school at R.T. Nagar, was particularly inspired by the flower displays, as he grows flowers and designs similar arrangements as a hobby. The largest display at the flower show was a model of the Qutub Minar made of different color roses. Students were amazed that such a large structure could be made from flowers alone, and some of them even commented on how all of these flowers would eventually go to waste! 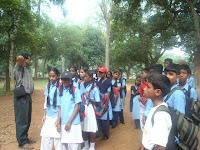 After the flower show, students explored the remaining sites at Lalbagh. They visited the HMT flower clock, which is seven meters long in diameter. 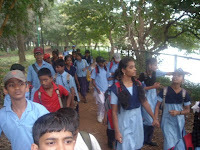 The students walked around Lalbagh Lake (where they noticed various flora and fauna in the lotus pond) and the rose garden. 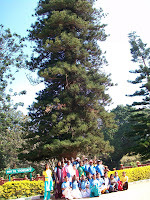 Students also observed the 20 million year old tree fossil at Lalbagh. This was followed by a discussion of how fossils are dated by the chemical process of radioactive decay; a topic covered in the 10th standard chemistry syllabus of students. 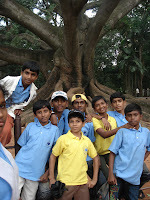 Students enjoyed visiting the famous elephant apple tree of Lalbagh, and posed for group pictures under Lalbagh’s tallest tree and famous silk cotton tree. In the middle of the field trip, students took a break to run and play in the gardens, and take in their beautiful surroundings. Several students discussed how the trees at Lalbagh, most of which are hundreds of years old, are important historical artifacts. This was followed by an active discussion on how more than 40,000 trees will be felled in Bangalore (including trees at Lalbagh!) due to road widening schemes and the construction of the Bangalore Metro. The field visit concluded with a visit to Kempe Gowda tower, where students viewed Bangalore’s cityscape atop a hill made from 3,000 million year old Peninsular Gneissic rocks! They also visited the Lalbagh nursery where students purchased plants and vegetable seedlings to grow at home. Overall DSF’s HeadStart students enjoyed their visit to Lalbagh, with many of them requesting to come back and visit the gardens soon. 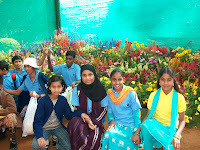 Their genuine interest in Lalbagh’s history and natural sites was inspiring, so much so that students enthusiastically purchased seedlings to create their own, yet smaller version, of the botanical gardens at home. Sackhumvit Trust would like to thank DSF for enabling us to work with their HeadStart students as part of our environmental education program. We are happy to share this resource with organizations and school communities dedicated to the education of underprivileged youth. ANZ Bank (Australia New Zealand Bank) is the largest Australian bank in Asia with over 170 years of banking experience and six million customers worldwide. ANZ Bank operates a software division in Bangalore, India, along with a Corporate Social Responsibility (CSR) division. ANZ Bank was keen to work with high school students at government schools for this programme, as these students often walk on the streets independently, ride bicycles, rely on public transportation, and transport their younger siblings to and from school. According to the Government of India’s Road Safety campaign, over one lakh people die every year due to road traffic accidents, and road accidents are one of the leading causes of death amongst children in India. The workshop primarily focused on interpretation of road signs and best-practices while driving and/or walking on streets. It was explained to students that while the majority of them do not drive cars, an understanding of road signs is still important for pedestrians and cyclists. Students also learned best practices for crossing the road as a pedestrian, and key hand signals while riding a bicycle. The students participated enthusiastically during the workshops, with most of them expressing that they had learned something constructive. ANZ volunteers encouraged students to share this knowledge with their peers and families, so as to increase awareness on road safety. Due to time constraints, however, it was not feasible to incorporate a practical component to the workshop, where students could have observed road signs and safety practices on the streets surrounding their school under supervision of workshop facilitators. Such a dimension would have made the workshop more interactive and participatory. Sackhumvit Trust is grateful for the opportunity to bring together volunteers from ANZ Bank with the various school communities associated with Dream School Foundation. We hope this is the beginning of a long-term partnership that increases the cooperation of private and civil society volunteers with non-profits and government schools serving underprivileged students. Generation Next: Fun with Light! While conducting our Ozone module with 9th standard students at Dream School Foundation’s (DSF) education and development centres, we recognized a lot of parallels between this unit and their science chapter on Light. Sackhumvit Trust and our volunteers organized a series of experiments to facilitate students in understanding this topic as part of our Generation Next program. One of the first things we realized was that the 9th standard science textbook immediately jumps into an analysis of how light interacts with lenses, without explaining what light is. When asked for their ideas, students shouted out words such as “energy”, “the sun”, etc. While correct, our first objective was to deepen student’s understanding of light and its importance to our daily lives. 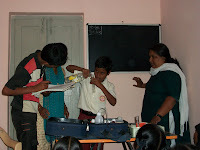 This was made possible largely due to a unique presentation prepared by Professor N. Chandrasekaran on the concept of light and its applications, which served as the foundation for the initial part of this program. Students examined the wave and particle theory of light, and learned about the discovery of photons. We then reviewed the entire electromagnetic spectrum where students learned about the relationship between wavelength, frequency, and energy, as well as the various uses/roles of the energy the Earth receives from the sun. A useful activity sheet for this topic came from the United Nations Environmental Programme’s (UNEP) High Sky: Ozonaction Education Pack for Secondary Schools. Students had to piece together a puzzle of the entire electromagnetic spectrum based on clues on the use/importance of each type of radiation along with their respective wavelengths and frequencies. Following this, students focused on a specific section of the electromagnetic spectrum: visible light. Here students learned about the role that light plays in coloring everything we see in the world. Many of them were boggled by the idea that our experience of the world is essentially a matrix, with photons of light registering in our eye to create what we see. Students reviewed the primary colors (red, green, and blue) and how combining these colors will create almost any other color. They found it interesting that the old name for computer monitors (RGB monitors) is based on the fact that they use the primary colors to generate images on the screen. 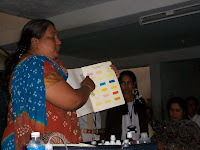 This was followed by an experiment called “Colors by Addition”, where students used three torch lights (each covered with red, blue, or green filter paper), to create various combinations of colors. Students noticed that when all three torches are superimposed on each other, they create white—hence white is made up of all the colors in the visible spectrum. After completing “Colors by Addition,” it was only logical that we explore “Colors by Subtraction.” Here students learned how we see colors not by their reflection, but by their absorption! It was explained that this mainly applies to inks, dyed cloth, and other materials that are not a light source, yet give off color. We see these items mainly because of the visible wavelengths that they do not absorb, i.e. we see the radiation that is left over after they have absorbed or subtracted certain radiation. creates the color red, because the blue and green wavelengths get absorbed. Students found this concept harder to grasp than “Colors by Addition,” but nonetheless enjoyed predicting what colors they would create from various combination of paints. As a primer to the textbook discussion on light and lenses, we covered one last concept of light. This is the various ways in which light can interact with an object: transmission, absorption, reflection, scattering, and refraction. As we already covered the concept of reflection and absorption in terms of seeing color, students readily picked up these concepts. To further illustrate the concept of reflection, students built their own kaleidoscopes and periscopes using the reflective properties of mirrors. This activity was a big hit amongst students, with most of them requesting to take their inventions home. For the remaining processes, we conducted simple experiments to explain what they meant. For transmission, students observed a piece of glass and how the can see perfectly through it, hence demonstrating how light passes directly through an object without any change. For scattering, we conducted a simple experiment where a red laser beam shines through a clear glass filled with water. Students then observed how adding drops of milk causes the laser beam to transform into a fireball of light at the beginning of the glass, instead of passing through the water as a straight line. It was explained that the fat solubles in milk scatter light, hence creating a fireball affect. It was also explained that reading the content of a poster, paper, etc., from any viewpoint is the result of scattering. In this case, light is not reflected as this would make the object appear bright and shiney like a mirror. Lastly, students learned that refraction is similar to transmission except that it involves the bending of light as it passes through an object. This was demonstrated through a simple experiment where students observed how a straw appears to bend when placed in a glass of water. Examples of real-life objects that refract light include diamonds and prisms. The remainder of this module focused on the use of lenses. Students learned the definition of lens as a transparent material with generally two (or more) curved surfaces that refract light. They learned how light is refracted for both concave and convex lenses, as well as terminology covered in their textbooks—such as focal point and length, optic centre, principal axis, radii of curvature, etc. Students learned that convex lenses magnify objects because they converge light rays, whereas concave lenses minimize objects because they diverge light rays. This was demonstrated by using a water droplet to magnify the text on a newspaper, and looking through convex and concave lenses purchased from a science lab store. Students also learned the meaning of a virtual focal point and how this applies to the image created by a concave lens. In fact, students were able to measure the virtual focal point of a concave lens by devising an experiment of their own! Lastly, to conclude the unit, we discussed the various uses of lenses in our daily lives. Students mentioned how lenses are used to make cameras, binoculars, microscopes, and telescopes. They enjoyed a presentation, also prepared by Professor Chandrasekaran, on magnifying powers, which showed a view from the world from the largest possible distance (outer space) to the closest possible distance (inside the cells of a leaf). This presentation beautifully illustrated the ability of lenses (and light) to guide our vision and overall experience of the world! 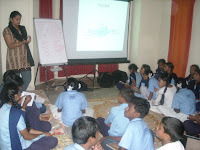 Overall, students enjoyed the activity-based nature of this program. Moreover, they easily picked up concepts in their textbooks once they were supplemented with hands-on activities. This ranges from understanding the meaning of light and the role it plays in our daily lives, to realizing what a convex or concave lens looks like and can do! Education ultimately boils down to making the subject matter accessible and engaging to our students, and we hope to have accomplished this here. Sackhumvit Trust would like to thank DSF for enabling us to conduct these lessons as part of its after-school tutorial program at the Yeshwantpur and R.T. Nagar education and development centres. Sackhumvit Trust is happy to share these resources with other schools and organizations dedicated to the education of underprivileged youth. Sackhumvit Trust completed a module on ozone depletion with 9th standard students associated with Dream School Foundation’s (DSF). 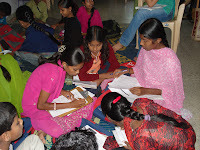 Sackhumvit Trust conducted this module as part of an after-school tutorial program offered at DSF’s academic resource centres in Yeshwantpur and R.T. Nagar. This module is the second in a series focusing on environmental issues associated with urbanization. Sackhumvit Trust utilized materials from the United Nations Environment Program (UNEP) for this module. UNEP has created a series of worksheets, activities, comic books, and videos based on the fictional character, Ozzy Ozone, to educate youth on the sources and consequences of ozone depletion. The module started with a cartoon video illustrating how ozone depletion enables U.V. radiation to reach the Earth’s surface and harm human-beings. 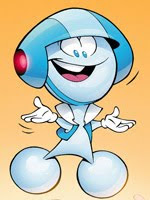 The video was effective at drawing student’s attention to the importance of ozone depletion, and students were quickly attracted to the character of Ozzy Ozone. The video was followed by a series of worksheets and activities included in UNEP’s High Sky: Ozonaction Education Pack for Secondary Schools. Students learned about the layers of the atmosphere, and their specific properties and roles in fostering life on Earth. Students studied the ozone layer in greater detail, and how its dramatic thinning, especially over Antarctica, has been coined as the ‘Ozone Hole.’ Students then studied the chemical properties of ozone. This was useful in explaining how ozone absorbs and reflects U.V. radiation to prevent it from reaching the Earth’s surface. It was explained that U.V. radiation supplies the necessary energy for creating and breaking down ozone, thus establishing a chemical equilibrium that keeps the amount of ozone in the stratosphere constant. This was followed by activities exploring man-made and natural sources for ozone depletion. Students studied the chemical process by which Chlorofluorocarbons (CFCs) and Hydrochlorofluorocharbons (HCFCs) breakdown ozone, which was facilitated by a useful diagram in the High Sky workbook . Students learned that the increased emission of CFCs and HCFCs in the stratosphere has disturbed the natural equilibrium of the ozone layer, resulting in a drastic thinning of the ozone layer. Students also completed a survey determining if their schools and DSF’s resource centres use materials made from or containing ozone depleting substances. Students concluded that their schools and DSF’s centres were relatively ozone-friendly, with the exception of their use of polystyrene cups. Students reviewed health affects of U.V. 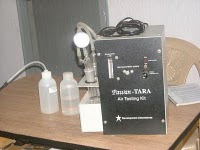 radiation which was facilitated by a puzzle that differentiated the three types of U.V. radiation (U.V.-A, B, and C) in terms of wavelength, reaction with the stratosphere, and their effects on human health and plant life. Students were also introduced to the creation of ground-level ozone by smog in lower levels of the atmosphere, and how this is dangerous for human health and plant life. Students then studied the U.V. index developed by the World Health Organization and tracked the ratings of Bangalore city from an online weather site; students were shocked to see the city consistently reported an index value of 11 (extreme)! This was followed by a review of conditions that increase our risk to U.V. 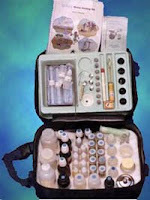 radiation exposure, such as time of day, time of the year, location, elevation, reflection, and weather conditions. Students then discussed how they can limit their contact with U.V. radiation, and possible action steps to be taken by their local community, governments, and international bodies to prevent ozone depletion. Students adored the Ozzy Ozone cartoon figure, and thoroughly enjoyed UNEP’s video and comic book productions. It would be worthwhile for UNEP to conduct a competition where students submit comic strips of Ozzy Ozone combating ozone depletion in their own country. This would enable UNEP’s content to appeal to a wider group of students, while encouraging students to apply their knowledge on ozone depletion in a creative manner. The coded message from Ozzy Ozone concerning properties of the ozone layer, the discovery of the Ozone Hole over Antarctica, and how ozone depletion is impacting nations all over the world was extremely popular. Students enjoyed learning a secret code and were fully absorbed in revealing Ozzy Ozone’s message. Students enjoyed the puzzle activity where they had to piece together the entire spectrum of radiation created by the Sun. 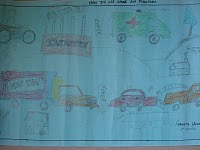 This activity was useful at demonstrating how U.V. radiation is just one component of the entire range of light or energy that influences life on Earth. This activity also related to the light unit covered in the 9th standard science syllabus of students, hence inspiring Sackhumvit Trust’s module on properties of light. The numbers game reviewing conditions that create ground-level ozone was a popular activity. However, the instructions for this activity were unclear and consequently obscured the activity’s learning objectives. Students were more focused on solving the number puzzle, as opposed to understanding how various factors can create ground-level ozone. This is because they were not sure what all the numbers represented. The diagrams illustrating ozone equilibrium and how ozone depleting substances disturb this chemical process were particularly useful. As students often struggle to understand the change taking place in chemical equations, it was helpful to visualize the process of ozone creation and destruction. There were additional activities in the High Sky workbook that we could not complete due to time constraints. Moreover, students were also unable to participate in certain activities due to their limited knowledge of English. This includes recreating the Montreal Protocol summit to advise policy on ozone depletion in sessions of 5-7 of the High Sky workbook. 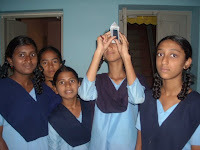 Students also started to lose interest in studying ozone depletion as it did not relate to their coursework at school. Based on these observations, our volunteer teachers decided to focus on basic knowledge of ozone depletion (hence our coverage up until session 3 of the High Sky workbook), and transitioned to exploring properties of light. This has enabled us to cover concepts relevant to ozone depletion in the context of the science syllabus of our students. We found that it is more effective to raise awareness on ozone depletion through supplemental activities that complement the school work of students, as opposed to teaching this subject entirely on its own. We will continue to complete activities in the High Sky book in this manner, especially those in session 4 that explain the difference between ozone depletion and global warming. These exercises relate to the carbon cycle reviewed in the biology syllabus of our 9th standard students. Sackhumvit Trust would like to thank DSF for enabling us to work with their students as part of its after-school tutorial program. We are also grateful to UNEP for sharing its learning materials and hope that our review of this module has been constructive. Sackhumvit Trust organized a series of classroom activities exploring the topic of air pollution in the context of the 9th science syllabus of state board schools in Bangalore. Sackhumvit Trust partnered with Dream School Foundation to organize this program at local government schools, and DSF's education and development centres in Yeshwantpur and R.T. Nagar. The first module covered as part of this project was air pollution. The module started off with students exploring what is air by testing its properties of weight, pressure, volume, and temperature. 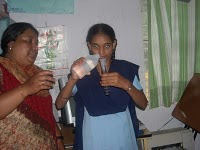 Students conducted various experiments such as comparing the weight of two different sized balloons; testing whether water spills out of a plastic cup covered with a piece of paper and flipped upside down; building their own barometer to measure air pressure; and observing the change in shape of a plastic bottle that is heated up with hot water and then cooled over time. These experiments, although simple, were new to most of our students and effectively related to the states of matter unit covered in their science textbooks. The module then went on toexplore the relationship between air temperature, pressure, and weather. Students learned the meaning of cold and hot weather fronts and how the interaction of hot and cold air masses create certain weather patterns such as rain, fog, and thunder storms. Students also learned that wind is a consequence of hot air rising to be replaced by cooler and denser air. This was followed by an examination of land and sea breezes, for which the Indian Monsoon was used a specific example. As a fun activity, students built their own anemometers to measure the speed of wind, which required them to apply basic mathematics along with creative engineering skills. Students also constructed a wind vane where they measured the direction in which the wind blows. The module then transitioned to explore air pollution. Students learned about various types of air pollution including respiratory particulate matter, carbon dioxide, sulphur dioxide, nitrogen oxides, volatile organic compounds, and ozone depleting substances. Students learned of natural and man-made sources for these pollutants, and their impact on human health and the environment; i.e. smog, acid rain, global warming, ozone layer depletion, etc. An interesting case-study concerning the parthenium weed and its association with severe airborne allergies in Bangalore was also reviewed. 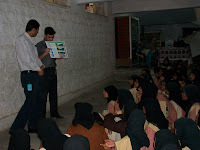 Several activities were organized to engage students on the topic of air pollution. Students participated in a walkabout after which they produced an air pollution map demonstrating sources and sinks for air pollution in their community. It was encouraging to see how involved students were in the walkabout, many of whom freely asked auto drivers, roadside vendors, and pedestrians for their opinion on the Bangalore’s air quality. To link this section of the module to the science studies of students, several sessions were organized to review the periodic table – the history of its development, and how to read the table to infer properties of an element and draw atomic structures. Students were then taught how to draw molecular structures for the various air pollutants they were learning about. 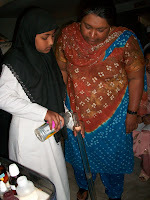 Sackhumvit Trust also organized for Mrs. Shalini from CLEAN-India (Development Alternatives), to conduct an air pollution experiment in which students measured the levels of respiratory particulate matter, sulphur dioxide, and nitrogen oxides in their neighborhoods. Students were excited to conduct a science experiment involving a lab equipment and chemicals. This activity also required students to learn the concepts of hypothesis, data collection and analysis, and conclusion – the fundamental building blocks of science reporting. Students were encouraged to learn that the level of air pollutants in their neighborhood was below the danger thresholds as indicated by CLEAN-India. To help students understand the process by which air pollutants can cause dangerous health affects, our volunteer teachers reviewed the human respiratory system and the process of gaseous exchange in line with their biology studies. Students were given the opportunity to build their own version of the respiratory system using clay, an activity that strongly appealed to our artistic students. Lastly, to touch upon the complexities of global warming and how it affects the well-being of children, our volunteer teachers organized an activity where students built a collage of articles from their local newspaper discussing climate change. Students were surprised that the majority of articles discussed the acute drought in Karnataka due to the delayed monsoons, followed by severe flooding in northern Karnataka during recent months. Other interesting articles concerned India’s discovery of water on the moon; the use of rain water harvesting facilities by Karnataka’s Chief Minister, Yeddyurappa; and an opinion editorial debating the significance of climate change. Students also reviewed a fact sheet prepared by UNEP TUNZA detailing how climate change affects children all over the world. Most students were shocked to learn the dramatic number of children worldwide who suffer from displacement, malnourishment, lack of clean water, and acute airborne allergies such as asthma. The air pollution module concluded with an examination of indoor air pollution and the benefits of indoor plants. Students reviewed the sources, chemical properties, and health affects of formaldehyde, benzene, and other pollutants commonly found in our homes. 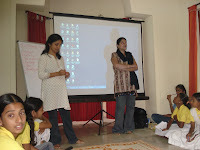 They also learned about various indoor plants indigenous to Bangalore and how they can help improve the quality of air. Sackhumvit Trust would like to thank Dream School Foundation for enabling us to work with students from its various partner government schools. We would also like to thank Environment Support Group for guiding us in developing hands-on activities for our science education program. 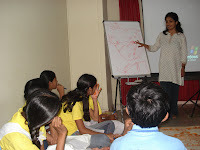 As part of our endeavors in environmental education, Sackhumvit Trust organized a workshop for 7th-10th standard students at Dream School Foundation’s (DSF) Yeshwantpur and R.T. Nagar education and development centres to learn about ecological issues associated with the urbanization of Bangalore. 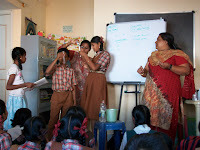 The workshop was an engaging and unique experience for DSF’s students, most of whom attend government schools which are unable to dedicate sufficient time and resources for teaching environmental studies as part of their school syllabus. The workshop covered a variety of topics including the history and current status of Bangalore’s urban lakes, the effectiveness of watersheds in securing water supply, and urban waste management in the state of Karnataka. 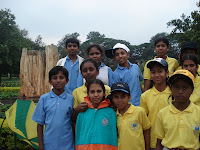 Students also visited Lalbagh where they participated in bird watching, and learned about the history and unique landmarks of Bangalore’s botanical gardens. Sackhumvit Trust organized this workshop in partnership with Environment Support Group (ESG), a non-profit organization dedicated to research, training, campaign support, and advocacy on a variety of environmental and social justice issues. We would like to thank ESG for sharing their knowledge and resources, without which this workshop and Sackhumvit Trust’s larger endeavors in in environmental education would not be possible. We would also like to thank DSF for encouraging their students to dedicate time during their school holidays to explore the environment and its relevance to their daily lives. 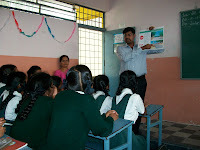 Students were asked to name lakes and water tanks in their community (Sankey Tank was a popular reference), after which they compared features of these water bodies with those of a village lake. Students generally concluded that community members have more freedom of access to water bodies in a village setting. This led to a discussion on the privatization of lakes in Bangalore, where ESG explained how the Bangalore Lake Development Authority’s (LDA) scheme of leasing lakes to private companies has increased the public’s cost of access to these water bodies. Students calculated the average cost for a family to visit a privatized lake (~Rs. 1,000 including transportation, entry fee, food purchases, playground access, etc. ), and concluded that this was too burdensome for a resource that should be freely available to the public. ESG concluded with a case-study of a public interest litigation case they have filed against the LDA concerning the privatization of Lumbini Lake in Bangalore. Students also learned that lakes were historically developed in Bangalore as part of an intricate system that carried down water from natural reservoirs and rain collected at higher-level lakes to lakes situated further below. Not only did this system provide a simple and efficient mechanism for collecting and transporting fresh water in Bangalore, it also maintained the city’s level of ground water. ESG highlighted that Bangalore originally had ~360 urban lakes of which only 39 remain as of today! Students went on to discuss how the building of apartment complexes, bus stations, sports stadiums, golf courses, and so on, have disrupted the water flow between lakes and consequently reduced Bangalore’s supply of ground water. ESG informed students that Bangalore now pumps water over a distance of 100 km and up to a height of 1 km from the Cauvery River to supply most of the city’s water requirements. Students examined the typical structure of a lake (how it goes from shallow to deep) and the different types of organisms and plants that inhabit each level of the lake. Students learned the meaning of ecosystem – a system of interdependent organisms which share the same habitat. Students then discussed how dumping waste in a lake, particularly nutrient rich waste containing phosphates and sulphates such as sewage effluents and fertilizer run-off, can destroy a lake’s eco-system through a process called Eutrophication. Students learned that excessive phosphates and sulphates can produce water hyacinth – a free-floating perennial aquatic plant native to tropical South America. With broad, thick, glossy, ovate leaves, water hyacinth may rise above the surface of the water as much as 1 meter in height. The common water hyacinth (Eichhornia crassipes) is a vigorous grower known to double its population in two weeks. When not controlled, water hyacinth will cover lakes and ponds entirely; this dramatically impacts water flow, blocks sunlight from reaching native aquatic plants, and starves the water of oxygen, often killing fish. Water hyacinth is often problematic in man-made ponds if uncontrolled, but can also provide a food source for fish, keep water clean and help to provide oxygen to man-made ponds. Students watched a short film about a water shed project at Zilla Parishad School located in northern Maharashtra. The video explained the concept behind a watershed - a drainage basin constructed to collect fresh water from rain, rivers, etc., for use by the surrounding community. The video demonstrated how a watershed built by a small village increased their agricultural produce and supply of ground water. The watershed’s construction was also connected to a project for building a self-sufficient school to educate village children - Zilla Parishad School. Both the watershed and Zilla Parishad School were built by the voluntary labor of community members. The video also showed how students at Zilla Parishad School regularly interact with nature as part of their school studies by participating in tree planting, seed banks, composting, cleaning of the school, youth conferences on the environment, cultural activities, and so on. Students enjoyed the short film as it opened their eyes to an educational experience entirely different from their experience of attending a government school situated in a big metropolis. Most students were not aware of the history of their school (how it came to be, who built it, etc. ), nor if their schools participate in any environmental initiatives such as composting, rain water harvesting, paper recycling, etc. Students were then asked how they can act to better integrate their daily lives and schools with their surrounding environment. This component of the workshop started out with a game where students brainstormed different types of urban waste such as plastic, paper, aluminum, biomedical waste, and toxic waste. This was followed by a documentary, Nammooru Chandadooru / Nagara Nyrmalya, which brought up issues of urban waste management in the state of Karnataka. Students were engaged by the movie and learned about the importance of recycling, reusing, and reducing. ESG then shared a case-study of illegal waste dumping in Mavallipura located in Northern Karnataka, where piles of improperly disposed garbage have produced toxic leachates, effluents, and gaseous residues contaminating the ground water supply and air quality of surrounding village communities, hence causing severe health problems. Students were shocked to learn that such grievances are suffered by people in their own community. When asked what they can do on a personal level to alleviate this problem, students expressed that they would make a greater effort to recycle at home. Students also learnt a simple way of composting at home by the brick, bagasse and compost method. This method requires an old bucket with some small pin holes. The bottom of the bucket is first filled with charcoal or brick followed by a layer of sugarcane bagasse. Some water is sprinkled and a small amount of manure is added as a starter. On this the everyday kitchen waste comprising of vegetable peels, dry leaves, and flowers can be added and in 45 days the first harvest of compost can be obtained to use in home gardens. 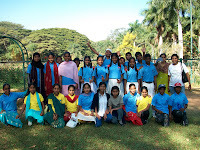 The second half of the workshop involved a visit to Lalbagh facilitated by Mrs. Bhargavi (Yeshwantpur students) and Mr. Leo Saldhana (R.T. Nagar students). This was the highlight of the day for many students who have never visited Lalbagh before. 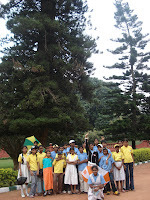 Students had a chance to walk throughout the botanical gardens, and learn about the historical significance of various sites such as the Kempegowda tower, a 20 million year old tree fossil, Bangalore’s tallest tree Araucaria sps, Lalbagh’s famous silk cotton tree and rose garden, and so on. 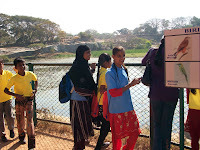 The visit concluded with a walk around Lalbagh Lake where students participated in bird watching and observed some water hyacinth growth at one end of the lake. 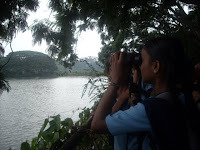 Students also observed some birds such as the Purple Moorhen, Pheasant Tailed Jacana, Coots and a Pond Heron, Kingfishers, Brahminy Kites, etc. Overall, students enjoyed their experience at Bangalore’s botanical gardens and most of them did not want to return home by day’s end! !